Although these are not Kettle Cooked Chips, they did have a superior crunch for a crispy thin Potato Chip. A handful did not instantly turn to mush once it was popped in the mouth, like some Chips do. Regular looking Chips, with some broken and oil bubble crushed bag constituents. There was a heavy brownish red dusting over the Chips which soaked up most of the visible oil, leaving a nice powdery finger residue. The Nose Plunge test revealed a nice sticky, barbecue aroma. Unfortunately this wasn't followed by a taste of similar standards. 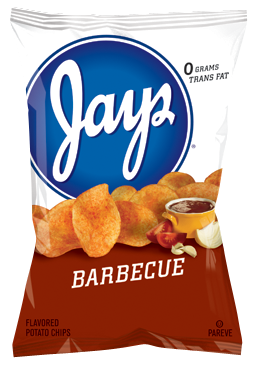 It was a salty, sweet barbecue flavor taste, but it was mild. There was no heat, just a fairly weak, but easily munchable flavor.